As a digital asset management service, Pics.io provides all the necessary tools for creative professionals from uploading the initial design brief, throughout the entire project development process, and right up to the final step - project presentation. Showing your projects to clients and partners outside Pics.io is very easy with the help of public websites. You have a variety of customizable websites to choose from, which all work on any device and in any browser. Select a collection of files that you want to be showcased on your website. Locate the mouse cursor on the name of the collection and click on the “globe” button that says Publish to web. Choose a template for the website you want to create. Please note, that if you want to create an interactive website where other people could leave comments, you should choose Proofing Template option. Customize your website the way you want: protect your website with a password; set up the website functionality; set up SEO tools, etc. Click live preview button to check how your website looks before you publish it. Once you have finished setting up the website, press the blue Publish button in the top right corner. Once you have created a website, the icon next to the name of the collection turns into a globe. In this way, you can easily see which of your collections are published to the web. 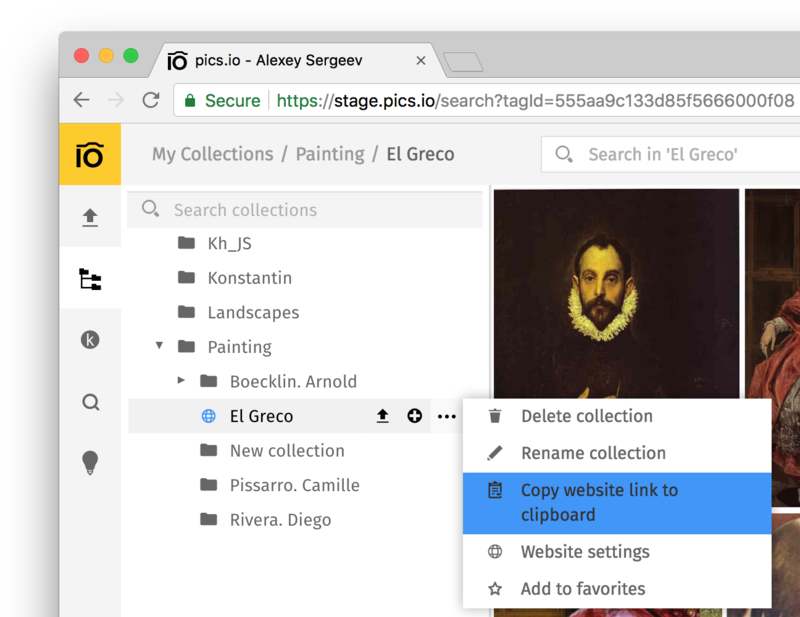 The whole list of websites that you have created in Pics.io is also available above the tree of collections. The number of websites you can have at a time depends on your billing plan. How can I share video files via a website? Sometimes you need to share your video files outside Pics.io. In order to do it, you need to create a collection and download the necessary videos to it. After that, you need to perform the usual steps of publishing a collection to web as described above. We recommend to use Lumière template for publishing video files. It is the best theme to show your videos to clients or teammates. Still, if you need to collaborate with your clients, Proofing template is for you. It allows the people who see your website to interact with you using comments, rating, modifying custom fields, etc. How will other people get access to the website? Once the website is created, a message will be sent to your email with a link. You can share this link with anybody to need. If you choose to restrict the access to your website with a password, make sure you share it with your collaborators as well. You can also find the link to the website in the tree of collections. Just hover your mouse over the name of the collection that you used to create your website. One of the options will be “Copy website link to clipboard”. So you can copy the link from here. How can I customize my website? In the process of creating a website, you can do a number of customizations to serve your goals and needs. First of all, you can customize the web address of your website. By default, it is “http://show.pics.io/collection name”. You can type anything you want instead of “collection name”. If you want to see your own domain DNS included in the website URL address generated by Pics.io, you need to create a DNS record that will point some subdomain like sites.yourdomain.com (you can change "sites" with any word) to show.pics.io IP address. We recommend to create CNAME record pointing to show.pics.io. When DNS propagation is done you can edit URL in a site settings. Like replace show.pics.io/your-collection-name with sites.yourdomain.com/your-collection-name. You can also enable password protection to guarantee the security of your website. Just don’t forget to give the password to your partners and collaborators. Proofing template allows even more opportunities for customization, such as allowing your collaborators to change the thumbnails options, leave comments, etc. * Disclaimer: due to technical limitations, downloading files as an archive is not available for websites with more than 300 files. 4. “Seo” page allows you to set up the SEO tools. In this way you will know who your visitors are and where they come from. Your website can be connected to Google Analytics to track visitors and generate various reports. Here you can also set the custom gallery title to change the site page title that you’ll see in the browser. What is the difference between templates? There are 10 types of websites you can choose from in Pics.io. A special type of website is Proofing template. It does more than just help you showcase the results of your work. It lets your collaborators and customers interact with your website, i.e. search for the necessary files, rate your assets, leave comments, modify custom fields, etc. The remaining 9 templates don’t allow interactive collaboration, but they are great to showcase your work in a classy manner. Just click through the gallery of templates and choose what you like best. If you have sub-collections inside the featured collection and you want your external collaborators to have full access to them, we recommend to choose the following templates: Square, Space, Simple, and Proofing template. How can I modify the website I have created before? The websites in Pics.io are created on the basis of your collections. So, if you need to update the content of your website, all you need to do is to update the content of the corresponding collection. The changes will be added automatically and published on the website. Press Update settings. All the changes will be saved in your website. How can I delete a website I created? When you hover your mouse over the title of your website, one of the icons you can see there is a trash bin. Be careful, though. When you press this icon, you will delete this website together with the corresponding collection. In most cases, you don’t want that. In this way the website will be deleted, but the corresponding collection will remain safe and secure. How can I embed my website into another online page? 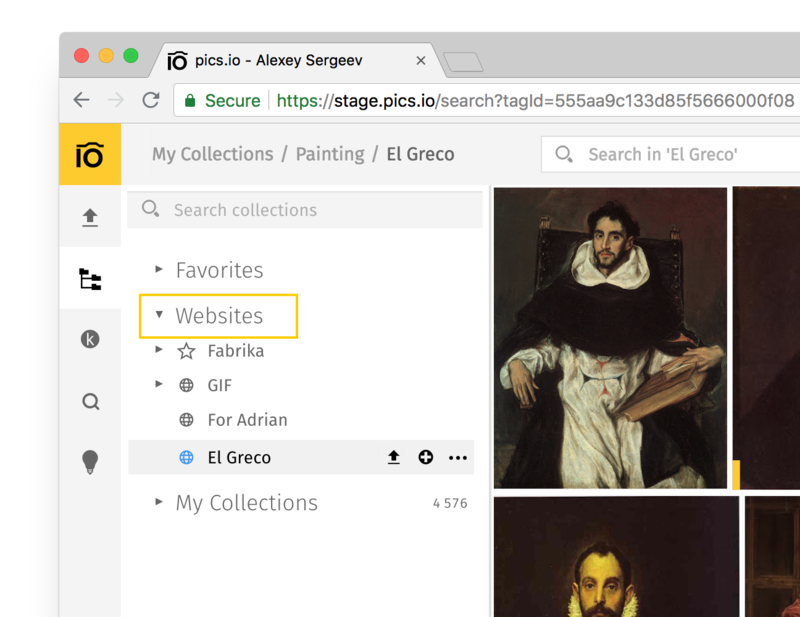 It is possible to insert a single asset or your Pics.io collection published to web right to your website using IFrame. IFrame is a window frame with a content, image or text file from any other site. To do so, just mouse over the collection published to web in the right-side collections tree -> click on the globe icon to go to the website settings -> in the "Main" section of the settings copy the website link and paste it into the IFrame string. Google doesn’t let my collaborators see the assets published on the website. What shall I do? 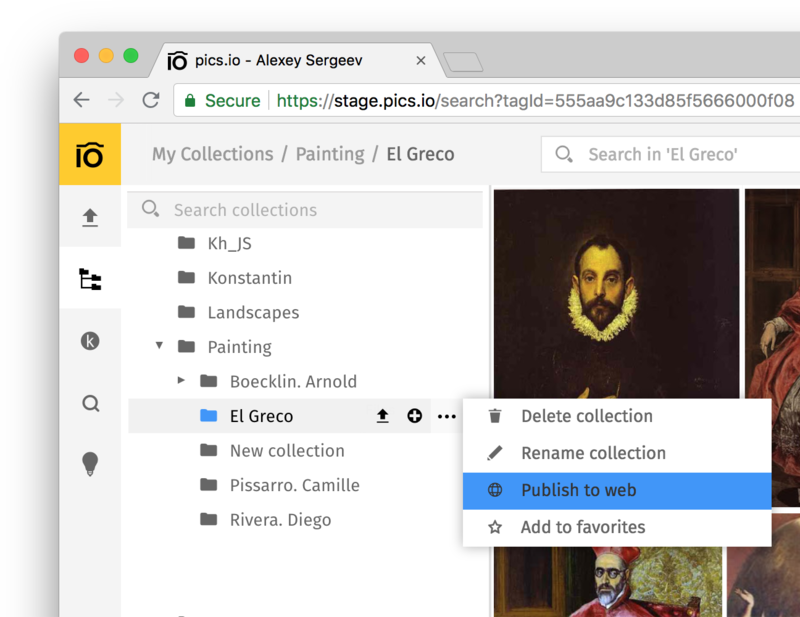 As Pics.io works on top of Google Drive, the files you share with the help of websites, are actually shared from your Google Drive. The process of sharing usually goes smoothly. 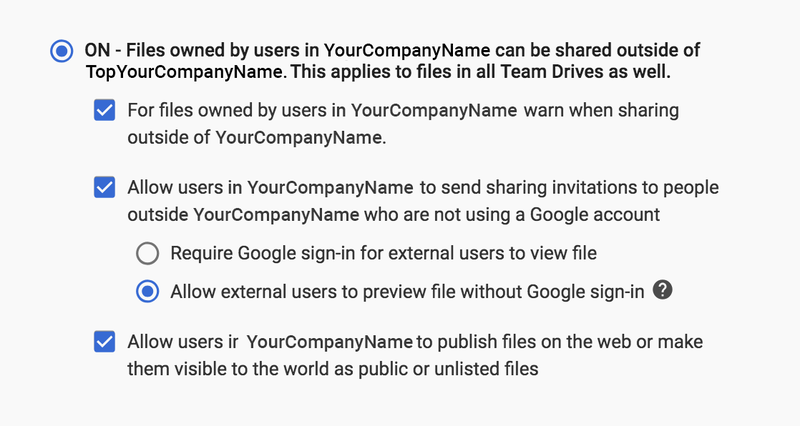 Sometimes, however, your partners and collaborators may complain that they cannot get immediate access to the files and collections on your website because of some Google restrictions. Especially, if you published a video or a pdf file on your website. If something like this happens, you need to check the settings of your corporate Google account. 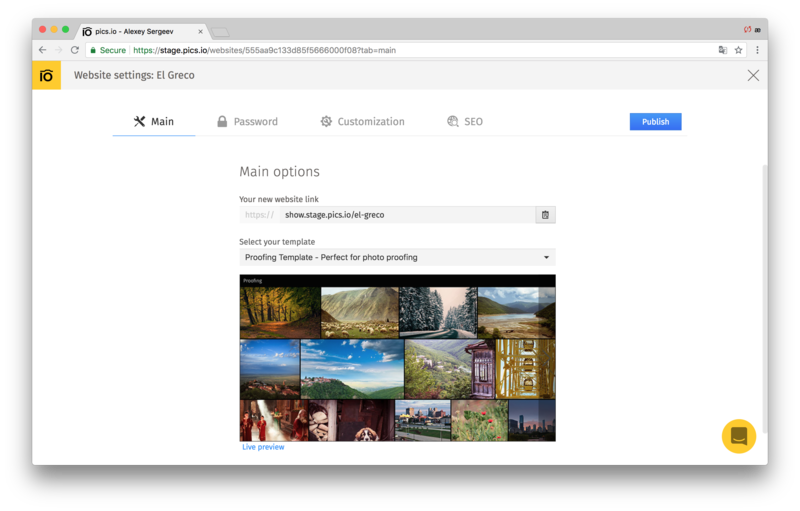 Make sure you tick the boxes that allow you and your Pics.io teammates to share files outside your Google account to people who don’t belong to your team and who may even not have a Google account whatsoever.